An event-packed celebration with tours, soccer games, outdoor movies, bowling, chapel, a nine-hole golf tournament, fun run and hugs — that’s just part of the fun at Family Weekend, scheduled Oct. 7-9. “It’s a great time of year, and students have been on campus long enough to have gained their footing. 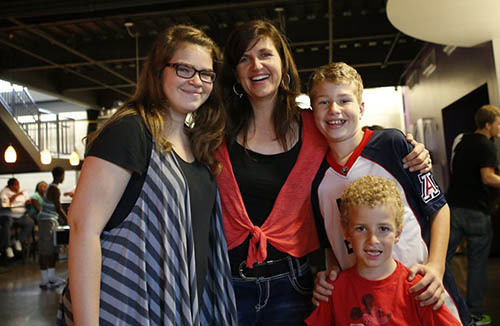 The time is right for a weekend visit with their parents, their families,” said Jeanne Lind, Parent and Family Programs Coordinator for GCU Office of Student Engagement. One of the biggest events at Family Weekend is the introduction of the men’s basketball team at Midnight Madness. Kathy Seter returned home last year to California from Family Weekend at Grand Canyon University tired, but content. “I left with the reassuring knowledge that our daughter Elizabeth is in a safe and nurturing environment. The weekend built a strong connection with campus that lasted long after my husband and I left for home,” said Seter, now a member of the GCU Parent Council. Family weekend is a great way to bring students and their families together. This weekend, the Seters return for Family Weekend, joining a record number of families visiting campus Friday to Sunday for an event-packed celebration with tours, soccer games, bowling, chapel, a fun run and hugs from students. More than double the thousands of families — from parents, grandparents to siblings — are expected to attend the 2016 Family Weekend over last year. “The interest this year has been incredible,” said Jeanne Lind, Parent and Family Programs Coordinator for GCU Office of Student Engagement. Family Weekend allows families to visit students six weeks after moving into dorms and apartments on campus. The majority are families of freshmen and sophomores. “It’s a great time of year, and students have been on campus long enough to have gained their footing. The time is right for a weekend visit with their parents, their families,” she said. The weekend also is designed to showcase GCU’s campus, academics, restaurants, sports, arts and spiritual life. 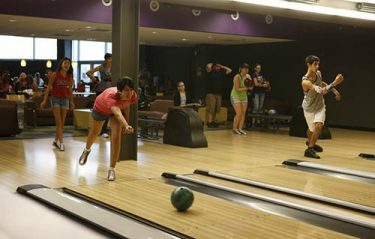 Bowling is part of the fun at Family Weekend. 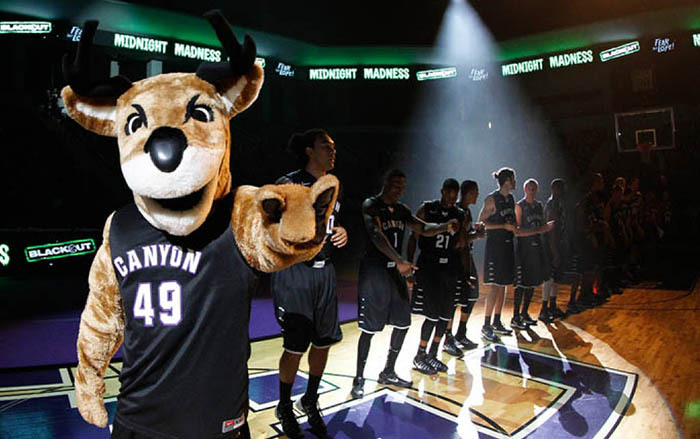 An inaugural nine-hole golf tournament and cheer and dance clinic are newcomers to the annual weekend lineup, which includes an outdoor movie, Thunder Run, ArtsJam!, introduction of the men’s basketball team at Midnight Madness and informal family dining at GCU eateries. The most popular event is expected to be Saturday’s Chapel service led by President Brian Mueller. Lind said the weekend offers events to keep families busy on campus while at the same time allowing for unstructured time together. “We try to maintain a balance. We want to offer enough things to do, but not so much that they don’t have free time together. 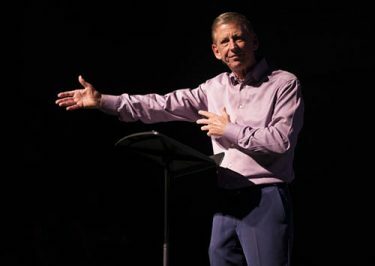 This is a weekend for families to reconnect,” Lind said. Family Weekend also provides GCU an opportunity to show parents how important they are to their child’s university experience. The most popular event at Family Weekend is expected to be Saturday’s Chapel service led by President Brian Mueller. “They entrust us with their child and we want to let them know that they are always welcome,” she said. This year the Seter family plans to attend as many activities as possible, including a repeat of last year’s hands-down favorite — Midnight Madness. The turbo-charged, smartly choreographed pep rally turned the Seters into avid Lope basketball fans who watch live games streamed to their computers. Along with spending time with their daughter, the couple will be busy stockpiling visual images to take home to Redlands. “We had a blast last year and left with a wonderful visual image of where Elizabeth was living and going to school,” said Seter, an elementary school math teacher. Friday, Oct. 7: Recreational activities, shotgun golf tournament, bowling, campus tours, movie and Midnight Madness. Saturday, Oct. 8: Thunder Run, chapel, recreational activities, tours, cheer clinic, art’s jam and men’s soccer game. Sunday, Oct. 9: Goodbyes and women’s soccer game.